Many questions are very common, so maybe you’ll find the answer you are looking for over here. Thanks! All of our frames are hand-crafted from high quality Finish birch wood. They only weigh about 15 grams thanks to the used material. Just to have a comparison: the same model in plastic would be about 40% heavier. They are extremely resistant. To prove their durability we tested them in freezing and boiling water. Their texture is soft, highly adaptable and very comfortable for an everyday use. We exclusively use Carl Zeiss lenses. All of our quality glasses can be purchased with either sun or optical lenses. They are specifically handcrafted to support even the strongest prescriptions. You can easily exchange the lenses of our quality glasses, by pressure, as if they were acetate. No other wood glasses could do that. No other wood glasses are this resistant. We are really working hard to be as sustainable as possible. All of our glasses are of extreme high quality, handcrafted with the greatest care in Madrid. In which languages can I use ninamur.com? So far our website is only available in English. More languages will follow soon. Si hablamos Español. Si tienes dificultades con el Ingles nos puedes escribir a customer@ninamur.com y contarnos como podemos ayudarte. Recuerda poner en el objeto del correo “ESPAÑOL”. Si, parliamo Italiano. Se hai difficoltà con l’inglese scrivici a customer@ninamur.com e dicci come possiamo esserti di aiuto. Ricorda di scrivere nell’oggetto della mail “ITALIANO”. Just 13,90 € for Non-EU-Countries and the rest of the world. How can I buy my Nina Mûr? To purchase on our website, you only have to choose one or more of our available models and buy them with the help our online purchase system. If you have any problems or if an error occurs during the purchase, don’t hesitate to contact us at customer@ninamur.com. We’re going to solve your problem as soon as we can! We accept Debit or Credit Card (Visa, MasterCard, Maestro, American Express). We satisfy all security standards when it comes to the data you provide us. All your information is going to be secure and safe at all times. We don’t store any of your banking information supplied during the purchase of any of our products. To process your order, your data is going to be encrypted and sent safely through our payment gateway (ING GROUP), which meets the most advanced security standards and is in charge of completing the transaction with your bank. Please make sure you have entered all the required details accurately. If you chose to pay with Credit Card (VISA or Mastercard), make sure that the card number, name of the card holder, expiration date and the three digit CVV-code on the back of your card are correct. For the direct banking options Sofortüberweisung, GiroPay and EPS, please contact your bank to make sure you have enough coverage on your account and that you are able to make an online purchase. Can I buy Nina Mûr in a store? Yes! Have a look at our stockists (XXXXXXX) and search for the store close to you. If you couldn’t find the model you were looking for or if they didn’t have the right size, don’t worry. You can simply check our catalogue online and choose your favorite pair. Is the leather case included in the price of the glasses? Sure, it is. The commercial price actually would be 29,00 €. So you are saving 29,00 € buying your Nina’s. To purchase more than five sunglasses please send an email to customer@ninamur.com, and write in the email subject “BIGGER ORDER“. The measurement for Nina Mûr eyewear can be found engraved on the inside of the temple arm or on the acetate tip. Most eyewear brands print these details in a similar position. If you already have a pair that fits well, you can compare the measurements just to have an idea about how our frames will fit your face. I received my Nina’s, how do I know if a frame fits me? Are they comfortable? That’s a great start. Yes, they are. Check our test: -3º TEST // 100º TEST. Could you do the same with plastic eyewear? No, you definitively couldn’t. Why are the glasses so resistant? We create our own plywood by layering fine sheets of high quality Finnish birch wood and by pressing phenolic resins into the curves of the wood. In this way we don’t only get a very resistant material but also a highly flexible and lightweight one. How do you cut the frames? To get the perfect cutting and standardization of quality glasses we work with a CNC milling machine. Thanks to this technique our frames are highly accurate which also lets you change your lenses very easily. Thanks to the organic shapes of our frames, the glasses perfectly fit the physiognomy of all faces. Thanks to manual sanding and a natural polish (with a comprehensive corrosion protection), we create a soft, fine and long-lasting surface finish. Which materials do you use for the frames? We use fine sheets of Finish birch to create our own plywood. Our wood comes from controlled certified forests. Which hinges do you use? We only use PREMIUM OBE GERMANY hinges for all of our quality glasses. The substantial 5-barrel hinge provides the greatest strength and durability for the structure of the frames. Which tips do you use? We only use Italian acetate terminals which is the best quality for tips. Which type of lenses do you offer? We exclusively use Carl Zeiss Lenses for all our quality glasses. Are the Carl Zeiss lenses good? Carl Zeiss lenses were the ones that the NASA used to document the Apollo lunar mission and the ones that Stanley Kubrick trusted to shoot his film Barry Lyndon. This is why we think that they are the best lenses on the market. Can I replace the lenses of my existing Nina frames? Sure, you can as long as the frame is in a good condition. Can I put prescription lenses into my Nina Mûr frames? Please note that all of our eyewear is handcrafted specifically to support even the strongest prescriptions. We have worked hard on the precision of the bezels to ensure an easy adaptation of prescription lenses up to 8 diopters. 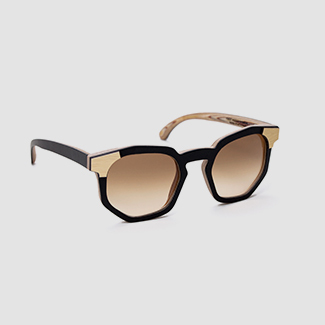 Can I order my Nina Mûr Eyewear with a lens prescription online? In this case, please send us an email to customer@ninamur.com with your prescription details. Write in the email subject “OPTICAL LENSES” and don’t forget to mention the model you are interested in. We will reply as soon as possible with availability and costs. I like a model with sun lenses but I would like to have it with optical lenses. Is that possible? 1) Send us an email to customer@ninamur.com with your prescription details. Write in the email subject “OPTICAL LENSES” and don’t forget to mention the model you are interested in. We will reply as soon as possible with availability and costs. 2) Buy the glasses that you like. Once you have received them, you can simply go to an optician close to you and ask to assembly your lenses. Please note: it is important that your opticians takes the full responsibility for the assembly of the lenses. If you have to change or cancel your order and you have already received your order confirmation, please write as soon as you can to social@ninamur.com. Write in the email subject “CANCEL MY ORDER” or “CHANGE MY ORDER” and don’t forget to include your order number. If we have not already sent your order, we’ll process your cancellation and refund you your money within the next ten working days. What is the difference between “Order Date” and “Shipping Date”? “Order Date” and “Shipping Date” are not the same. Orders placed before 11am on any given weekday will ship the same day. Orders placed after 11am will ship the following day. Although most orders are shipped the same or next day, please take weekends and holidays into account when considering the shipping date. Additionally, all orders are subject for review. On occasion, this may cause a slight delay in processing your order. Your patience is greatly appreciated. I haven’t received an order confirmation, is everything okay? Once the purchase is completed you’ll receive an order confirmation. That’s our way to confirm your purchase and to send you the order documents. If you can’t find the confirmation in your inbox, please don’t forget to check your spam or advertising folder. If you still can’t find it, write us at customer@ninamur.com and we’ll send you the copy. I made a mistake entering my personal information during the purchase. How can I change the data? If you have noticed that you made a mistake during the purchase of your Nina’s, write us to customer@ninamur.com and explain what happened. We’ll modify it as soon as possible. How can I request an invoice? In case you want to receive an invoice, contact us at customer@ninamur.com. Don’t forget to include your order number. In this way we can find your order much faster and issue the correct invoice. Does the shipment cost me anything? and just 19,90 € to Non-EU-Countries and the rest of the world. I’m ordering from a Non-EU-Country, Ceuta, Melilla or the Canaries is there anything I have to know? If your order goes to a Non-EU-Country, Ceuta, Melilla or the Canaries, you’ll have to consider possible extra fees (import sales taxes, customs duties and/or any submissions stipulated by the local authorities) that will be your responsibility. Customs policies change frequently, therefore we suggest to inform yourself about all possible extra charges at the local authorities. Once your order has been shipped, you will receive a shipment confirmation email that contains all of your tracking information. Do I have to manage the shipment? No, you don’t. We will arrange the pick-up for you. Does the exchange cost me anything? Our policy is simple: FREE EXCHANGE FOR ALL EU COUNTRIES, just 19,90 € for Non-EU-Countries and the rest of the world. You have 10 days after you received the eyewear to make your request. Does the return cost me anything? Our policy is simple: FREE RETURN FOR ALL EU COUNTRIES, just 19,90 € for Non-EU-Countries and the rest of the world. You have 10 days after you received the eyewear to make your request. You don’t have to ship it. We will arrange the pick-up for you. Once your package has been received, your refund will be processed within 3-5 business days. If there is a refund due, the credit will be issued in the original form of payment in Euro (€). The credit may not show up until the next monthly billing cycle of your credit card. You will be notified via the email address provided on the original order when the transaction took place. Please note that your banking institution may require additional days to process and post this transaction to your account once they have received the information from us. Any exchange rate differences charged by your financial institution are of the responsibility of the customer. Please email at press@ninamur.com. We’d love to help, and we look forward to hearing from you. How do I find a retail location close to me? Read more about our stores and showrooms here. Then visit one of our retail locations and see which frames are right for you! Or you can simply buy your quality glasses online at www.ninamur.com, remember our FREE SHIPPING, FREE EXCHANGE and FREE RETURN policy for ALL EU Countries! How can I have my frame repaired? Please return to the retailer where the product was purchased, or any authorized opticians to have your frame evaluated for repair. If you do not live nearby an authorized retailer, please visit the WARRANTY Information Page. Our frames are insured against manufacturer defects for one year after the date of purchase from an authorized retailer (this includes our online shop). All warranty claims must be accompanied by an original proof of purchase or itemized documentation, as purchase date and location must be verified. How can I get in touch with you if I have any doubt or question?